Do your finances worry you? Do you feel trapped? Like you have to put up with a horrible lifestyle because you can’t afford to leave a job? Do you not even have a job? Meet my friend Julie Tillotson. She recently told me the story of how she and her husband, Ben, pulled off what many in the United States and elsewhere consider financially impossible by thinking and acting internationally. Her story should inspire us all to realize that there are always better options out there if we are willing to be adventurous. 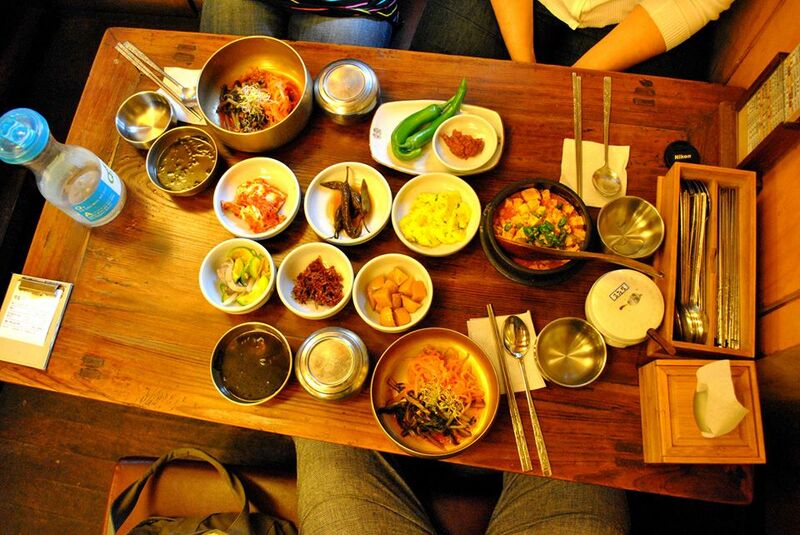 1) What was it that triggered your decision to move to South Korea? Financial insecurity and restlessness. Having repatriated to the US after completing university and getting married in the UK, Ben and I were searching for jobs and living with my parents (Thanks Mom and Dad!). After filling out 60+ job applications, we only managed to get part-time temp jobs with zero benefits. Wanting to be self-sufficient and passionately wanting to travel, EFL (English as a foreign language) jobs in Korea offered that and more: free plane tickets, free housing, medical insurance, pension and full time work experience. 2) How much do you make per year? My salary has been between 20,000-35,000USD* per year depending on the job and exchange rates. *These figures do not include housing, pension or other benefits that vary from job to job. 3) How much is it possible to save per month? Between 800-1000USD on a reasonable starting salary, more if you are super motivated. 4) Please elaborate on the school and other debt that you were able to pay off as well as the money you were able to save. Unfortunately, I had a credit card run up to 20,000USD from school bills and emergency use while unemployed. It took 11 months for us to pay it off by each contributing 800-1000USD per month. Over the next 3 years we saved a total of 80,000USD. We used the money to do MA degrees in the UK without needing student loans. 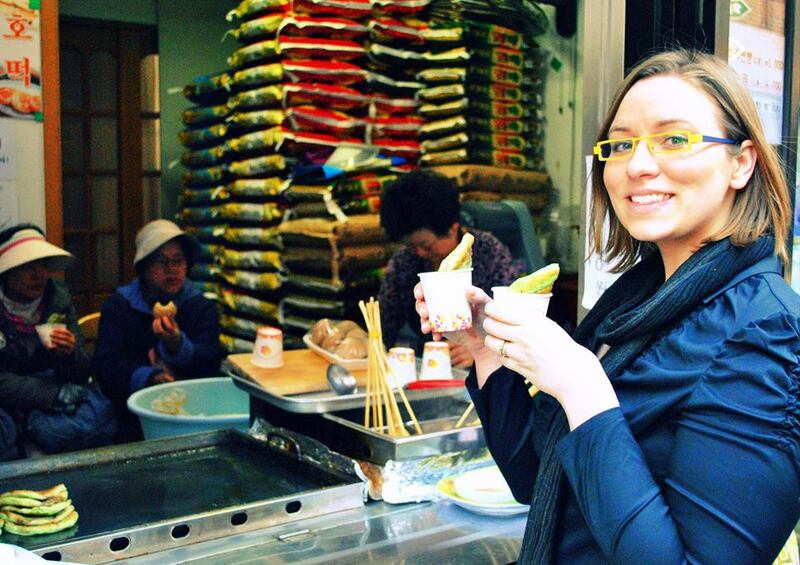 5) What is your advice to people that are considering going to Asia to find work and financial stability? A. Research! Customs, culture, and work environment are always more different than most expect. Familiar concepts such as contracts, employee/employer relationships, and set work responsibilities can be shockingly different to the unprepared. B. Documents first! It’s up to you and only you to have your work visa documents in order. With criminal background checks it can be a waiting game, so don’t delay! C. Quality photography! It’s standard procedure to include a photo for job applications in Asia. Professional appearance is highly valued in Asia. 6) What are the main risks in making a move similar to yours? Stress and illness. An international move, unfamiliar job, culture shock and contact with new bacteria and virus’ is a recipe for catching colds and flu. 7) How long do you plan on staying in Korea? Why? Two to five years. My job, friends and a comfortable lifestyle keep me here for now. However, the declining birthrate in Korea will hit universities with all-time low student enrollment within 5 years, so university jobs will likely become more competitive. 8) If you were trying to sell someone on doing what you have done in Korea, what would you say? As far as money goes, imagine what you can accomplish without paying for rent, car payment or gas. Korea has a growing economy where English teachers are in demand. Seoul is safe, has great public transportation, and there is always something fun to see or do in spare time. With dining like this, who needs persuasion? 9) What do you dislike most about living abroad? Long gaps in seeing family and long-time friends. 10) What are your top relocation tips? Don’t make assumptions about your host culture, take time to wrap your brain around things that initially seem strange to you. Do make additional friends outside your workplace through volunteering, church, sports and clubs. Do learn about local fresh produce and ingredients and create beautiful healthy meals at home. 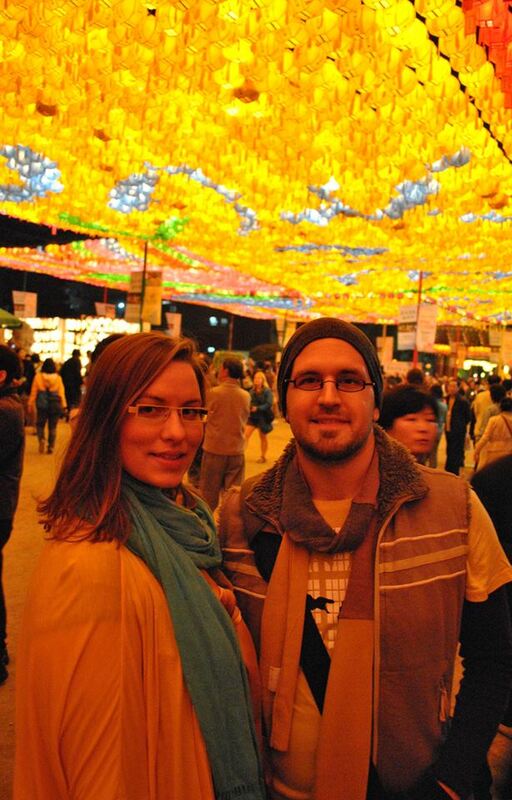 Julie Tillotson is an American who has been living in Seoul, South Korea with her husband, Ben for the past 9 years. She currently works at Seokyeong University in the General Education program and loves exploring the city in her free time. How Many Lazy Koreans Do You Know? Seoul is exploding with activity. I was last there a couple years ago and was blown away by the energy and sheer willpower on display. Every weekday my roommates woke up at about 5:00 AM to rush to work and school respectively. I would get in the spirit and go jogging down the streets of Gangnam-gu (Seoul’s Beverly Hills) before dawn and swarms of people would already be out, rushing to their first appointments. “Diligence” seemed to be the word on everyone’s lips. People worked ridiculous hours. School kids were in after-school classes until 8:00 PM or later at night. The city never seemed to stop. It blew my mind. 1) Koreans work the longest hours in the industrialized world. 4) Koreans, on average, take so little vacation time that, in 2010, the government felt the need to intervene and force government employees to submit plans to their bosses to take 16 days off that year. With this incredibly strong work ethic you would expend tremendous results. And to be fair, since the Korean War, South Korea has risen to and joined the ranks of some of the most wealthy countries in the world. However, all the hours and exertion don’t automatically translate into results. Korean productivity ranks very low compared to other industrialized countries. Why? Check out these thoughts from Korean politician Moon Kook-hyun, head of the Creative Korea Party. So take a lesson from the Korean example. Be diligent, by all means, but value results over dedication. You have a life to live.